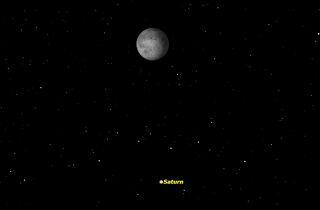 This sky map shows the location of Saturn beneath the moon at 5 a.m. local time on Wednesday, April 8, as seen from mid-northern latitudes. The official start of summer is still more than two months away, but it already is obvious what celestial object is likely to be the "most looked at" during star parties and outdoor astronomy gatherings during the balmy nights to come. It's the "Lord of the Rings" — the planet Saturn. Even seasoned veterans with many years of skywatching under their belts still get a surge of excitement when they gaze at Saturn and its incredible system of rings; without a question of doubt it's the most spectacular planet in the solar system. I love showing Saturn to people who have never seen it through a telescope before, especially kids. Talk about a "wow!" moment. For the last dozen years or so, Saturn's prime period of visibility has come during the winter or early spring months, when the weather is much colder and there are fewer numbers of people looking skyward. Even during the warm summer months, Saturn was not at its best. In August 2009, for example, Saturn appeared rather low in the southwest sky and the rings were turned more-or-less edgewise toward Earth making them quite difficult to see. But in the years to come, Saturn will at its best during the summertime. And the rings have been "opening up" each year since 2009; they'll continue to tip more and more toward Earth until late in 2017. But if you point your telescope toward it even now, you will be rewarded with a truly gorgeous sight. Saturn is becoming more prominent as the date of its opposition to the sun, May 22, looms closer. Appearing to the unaided eye as a very bright (magnitude 0.2) yellowish-white "star" shining with a steady, sedate glow, it rises above the east-southeast horizon soon after 11 p.m. local time and stands due south by around 5 a.m. the following morning. In terms of brightness among the 21 brightest stars in the night sky, Saturn would rank eighth, between Rigel in Orion and Procyon in Canis Minor. And here's a way to make a positive identification: Late this evening you will find it positioned 5-degrees below and a bit to the left of the waning gibbous moon (your clenched fist at arm's length measures approximately 10 degrees). A telescope magnifying 30-power or more will readily reveal the famous ring system whose northern face is now tilted nearly 25-degrees to our line of sight. Remember that what you are looking at is merely an illusion of perspective: the moon is 243,000 miles (391,000 km) from Earth, while Saturn is 3,540 times farther away at a distance of 860.3 million miles (1.384 billion kilometers). A final note: Should unsettled weather hide tonight's Saturn-moon pairing, they'll have another get-together four weeks from now on May 5. Editor's note: If you capture an amazing view of Saturn near the moon and would like to share photos with Space.com for a story or gallery, send comments and images in to managing editor Tariq Malik at: spacephotos@space.com.